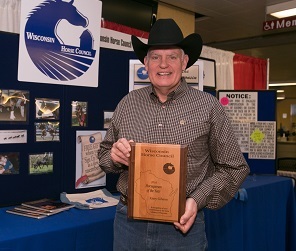 This year's Wisconsin Horse Council's Horseperson of the year recipient, Gary Gibson, is known in many different circles of the Wisconsin equine industry. Gary has been acknowledged for over 30 years for his humane training methods, showing, judging, and giving clinics. He has shown horses in both local and various national breed association shows. In addition to offering training and boarding, he regularly hosts clinics for all horse owners. He also hosts clinics that feature local veterinarians, farriers, and nutrition experts, providing valuable information to horse owners. Gary is a strong believer in life long learning. He spends a great deal of time studying and learning, whether it be reading publications, attending clinics, viewing instructional videos or sharing ideas with other horsemen. All who know Gary greatly benefit from this as Gary freely shares what he learns. When Gary judges, he often gets compliments on his fair approach to judging and his ability to take time to offer a piece of advice to encourage a participant who may have had an issue during the class. He is truly committed to helping horses and riders be the best they can be and enjoy the process. The Wisconsin Horse Council is pleased to introduce the 2016 Horseperson of the Year, Gary Gibson. This is the first year for a new award presented by the Wisconsin Horse Council. The first winner of this award was purchased as a wedding present for Mike and Patti McGowan's daughter but ended up back at Mike and Patti's home as a forever horse. Their daughter was supposed to sell Hez Got The Time, aka Cisco, back to her parents if she no longer wanted him, but the best made plans often go astray. Mike McGowan tried to buy Cisco back when he was looking for a new show horse. The people who then owned Cisco didn't want to sell him because he was such a good show horse. Later they changed their minds and contacted Mike. Mike jumped at the chance and bought Cisco back for his wife, Patti. However, Patti then gave Cisco to Mike. A good story could end right there, but there's more. Mike is a paraplegic caused by a riding accident when he was thrown by a horse. Cisco's extensive training and great mind made him a perfect horse for Mike's needs. Mike trained him to side pass up to a loading ramp so Mike could get on. Just like that, Cisco became a therapy horse as well as a show horse. Cisco has gone on to help many physically and mentally disabled people have the thrill of riding. He also is Mike's mount on trail rides in the Bighorn Mountains of Wyoming. Cisco's versatility also allows Mike to show in Wisconsin Foundation Quarter Horse Shows where he patiently waits for Mike to get in and out of his wheelchair and then loads and/or unloads from the horse trailer all by himself. The WHC is proud to introduce the 2016 Equine of the Year, Cisco.